To become a contributing author, just email me and I will add you as a contributor of articles of interest to other Independent Fundamental Baptists. If you do not want to post here, and only want to add your blog link to the directory and blog roll, that's great, too. Just add the button and email me at water05201@hotmail.com with your blog url and title. 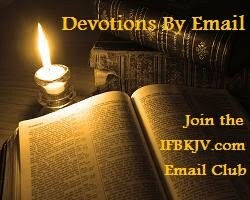 Please link back to IFB KJV Directory using one of the two images below. Have a blessed day! Greetings friends! Thank you for this wonderful blog that shares the beauty and authenticity of KJV of our Scriptures. I have so much difficulty when I visit a church that uses a different version as I have used KJV all my life and love it for it's beauty and correct interpretation. It handles God's Word so beautifully and honors God beautifully. The little church I attend is definitely a KJV church. 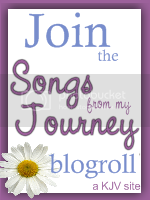 I have joined the blog directory here at IFBKJV and visit from time to time to read some of the wonderful posts. Please keep up the good work. My blog is varied, but when I refer to Scripture, you can be sure I will use my preferred and loved KJV. Visit me at: http://www.ChatWithVera.blogspot.com.